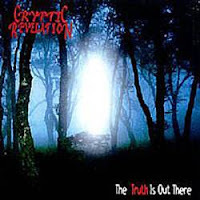 Even though Cryptic Revelation counts as an ancient death metal band, and one of the first death metal bands in Japan, they only had one EP during the long decades. That EP was musically a quite diverse one, mixing the old school style with the modern sound of death metal. From insane brutal hammering to slow, doom influenced themes they intoduced most common features, like if this record was a mini encyclopaedia of the genre. The productiveness of local bands showed up only in this short lenght, so it's maybe not so easy to get into for a start, but definitely worths to try. The common speed changes increasing the intensiveness too on the side of diversity. The vocal style isn't boring either, deep growling and insane screams switching each other. The lyrics are definitely following to the modern style of death, no sign of classical gore based topics, and the X-Files reference is also like an update compared to the old school horror movies. The source of their topics fits to the actual decade just like in the case of old bands 10-15 years earlier. It's probably one of the best early death metal records of the small Japanese extreme scene.